Shown here: Our destination—the villa where the whole family stayed the first week in Monsummano Alto. Not shown: the drive required to reach it. We’ve just returned from spring break in Italy, which is a very German thing to do, considering how many of our children’s classmates and their families did the same. We spent the first week in Tuscany with M’s immediate family (meaning his 15 closest relatives: father, siblings, spouses, nieces and nephews), and then spent a week along the coast and in Milan on our own. The views we enjoyed during the course of our stay were breathtaking and varied—scenes of pastoral hills terraced with olive gardens surrounding our rented villa, snow-capped mountains in the distance, foothills of the Alps; a wooden table under an arbor covered with blooming wisteria and humming with bees; small ancient towns that may not have changed a bit in centuries; uncelebrated 1,000-year-old churches; medieval walls encircling small, quaint towns; a still-standing Roman aqueduct spanning the countryside; and even the remains of an Etruscan amphitheater. And of course we took in a few obligatory yet stunning sights: the Leaning Tower of Pisa and the Duomo in the heart of Florence. A car is required to see most of these places (with the exception of Florence). 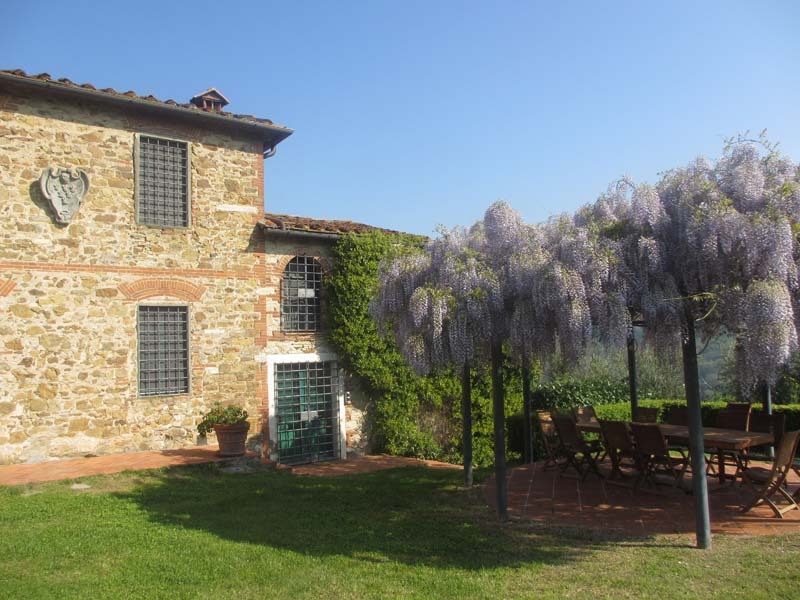 We simply could not have reached our villa without one, and considering there were twenty of us, it took not just one but four cars to bring us all to the top of the far-flung hillside where we stayed. Our adventure began and ended with cars; for me they became a dominant theme of the week, and I say this as a non-designated driver. The other themes that could be explored here include food (from the expected pasta, pizza, and gelato to the unexpected brains), family (the rich mix of adult personalities and bright-eyed children), missing Mom (this was the first family trip without her) or sickness (there were a variety of coughs, fevers, flus, and pains coursing through the family that kept us all on our toes), but for the moment I’ll set those aside and tell you about the mundane theme of cars. M’s family arrived ahead of us, having flown over together and caravanned in rental cars from Milan to Monsummano Alto, a three- or four-hour drive. We flew in from Berlin a few hours later and picked up our car at Maggiore rental. The trouble started when we tried to fit our two suitcases in the trunk of the Fiat. The trunk simply would not close. M and I tried everything, until we noticed that the trunk latch was askew and would not latch even if the trunk were empty. Now how this happened I cannot say; could it have been our dozen attempts to close it over the large suitcases? Or had it been in that condition when we first opened it? Suffice to say the attendants assigned us another car, an Alfa Romeo Giulietta. Our bags fit without any trouble and the girls did not complain about the cramped backseat. We were off… well, almost. M hadn’t driven stick in a while and could not for the life of him figure out how to get it into reverse. He asked me to try, me not having driven stick beyond a few lessons from a friend in a parking lot in high school. “Sure!” I said foolishly. I slid into the front seat, put my right foot on the clutch, and immediately stalled the thing with a great shudder, startling the kids in the back and myself as well. Whatever I knew about reverse was not going to help us now. “Never mind,” said M, climbing back in, and he eased it into first gear and we inched forwards. As we turned the corner he saw a man in a Maggiore uniform, so he rolled down the window and called out “Maggiore!” to get his attention, which set us to giggling when the man responded without annoyance. In case you’re wondering, you pull the clutch ring up to find reverse in a Giulietta. From there we were truly off, and we found the autostrade we needed without much trouble and headed south to Tuscany. All was easy peasy until we were within the last mile and trying to decipher the directions provided by the owners. Most of the roads we needed were unmarked, and so it was difficult to confirm that we were following the correct directions and not just taking the first left turn down a dirt path off the wrong road. Which was close to the truth. It was after 8 p.m. and the sun was fading fast, and we were deep down a shady one-lane dirt road on the side of a mountain with no sign of a villa in sight when it occurred to me that we had an Italian cell phone in our possession, loaned to us by Uwe, and it was high time we used it. A minute later I had M’s brother Chris on the line, and he was able to confirm that we were close but had turned off the paved road too soon. We needed to turn around. Well. Thank goodness Maggiore showed M how to put the thing in reverse, because it sure came in handy at that point. M took us backwards up the mountain road with rock on one side and slope on the other, no room for error, the rocks crunching under the tires and our girls beginning to whimper in the backseat. I wanted to whimper too, but didn’t. I thought we had missed a turn way back in town, but Chris was sure we hadn’t, though how he knew we were so close I’ll never know. We made it to the paved part and continued up the curving road until we saw a tiny building that matched the photo the owners had included in their directions—again there was no street name, just a dirt road turn-off at a roadside altar to the Virgin Mary, and here was the dirt road that matched Chris’s description, and yes, we saw a wall along the right side, and yes, we heard dogs barking in the background, and, can it be? There was Chris by the side of the road, cell phone to his ear. I’ve never been so happy to see anyone as I was at that moment. M was relieved to park the car and leave it behind for a while and be reunited with his family, and the kids quickly joined their cousins and the ten of them disappeared into different corners of the vast house and played pool and checked out the outdoor pool as well. The grownups helped themselves to big glasses of wine. In the morning we heard occasional beeps as cars went by, and I thought that was a nice yet somewhat grating custom, greeting your neighbors in their yards with friendly beeps as you went into town, but later I realized they honk because of the blind curve at the top of our street, where the road is so narrow that only one car can pass, and the beep is to warn any oncoming cars of their presence. They would continue beeping now and then at the other blind curves on the way into town. Live and learn. We took daily outings with all four cars, and in this way saw much of the surrounding countryside and notable towns. We put our feet in the Mediterranean at the beach town of Viareggio; we held up our hands to the Leaning Tower of Pisa. We drove the switchback mountain road up to the medieval city of Volterra, whose winding flagstone alleys, churches and Etruscan ruins captivated us until the wind picked up and rain came down and we ran back to our car to escape the cold. We biked the centuries-old walls that once protected Lucca from enemies, making it twice around the old city in our allotted hour. We drove to Pistoia and caught a train into the heart of Florence and walked around that magical city. After the first couple of days M came down with some sort of flu and took to bed and missed many of the outings. That meant our car sat unused much of the week. Our girls and I spread out among the other three cars, and in this way had more time with our family members who’d crossed the ocean for this trip. Not being among the drivers, I remained hopelessly oblivious to the hazards of driving through the congested Italian cities. 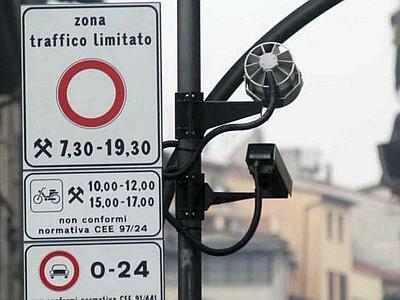 Italy has a nefarious system of video cameras mounted to catch driver errors, such as speeding on the highway, or entering zones that are restricted for local residents only. American tourists driving rental cars in unknown territory are particularly susceptible to this folly. Take, for instance, Phil’s good intentions of going to get the car and drive it the few blocks to pick up his passengers, among whom was his father-in-law, recovering from influenza and still weak, after the walk through the medieval city of Lucca had winded him. Great idea, we thought, until he pulled through the walls of the city and soon realized he’d been caught on camera driving into a restricted zone. There are no immediate repercussions of doing so; no sirens go off and no policeman appears. But the silent camera forgets nothing, and some day some government worker will type in that license plate and send notice of the infraction to the rental company, who will charge a handling fee to the car user and provide the home address of the renter to the authorities, who will, if internet chat rooms are to be trusted, track you down without mercy. Now this sort of thing makes me downright queasy. The factor of the unknown is too great. There’s the uncertainty of the amount of the fine, the futile hope that your car rental company will be too disorganized to pull up your address and comply with the government’s determination of your wrong-doing, combined with the sneaking suspicion that this is not the only time you’ve tripped the cameras. Phil rattled off four separate times he thought he’d been caught on camera in the various cities we’d visited. The car rental’s handling fee alone is 45 Euros; is that per infraction? How many of the other cars had done the same? And how much is each city fine anyway? I searched online today but found no answer, and what I did read made my queasiness markedly worse. I didn’t quite lose my breakfast but came darn close. I laid on the bathroom floor for a while, reminding myself you’re not actually sick, they’re just cars, it’s only money… and eventually the malaise went away. While in Italy I went online to try to catch up on the news and read an article by a man who went carless in Minneapolis and reports he is not just surviving but thriving without it. Though this is not exactly big news I read every word, and thought ahead to our return to the Twin Cities, wondering if we might be able to get by with just our one vehicle. The man in the article has no family to worry about, so he can maneuver quickly with his bike, the buses, trains, and car options like Zipcar, Hourcar, and Car2Go. I pictured myself doing the same at home, biking our youngest to school and biking or busing to work and wherever else I need to go. The new LRT line has a stop in front of my new office. The dream lasted until my family laughed off my idea, and asked how that was going to work out in the frigid winter months, with sports and music lessons and appointments, etc. With a little time it dawned on me that at home cars are rarely stick shift, the roads are well marked and are neither unpaved nor mountainous, and there aren’t limited access zones to stumble into and generate hefty fees, so my aversion to cars was short lived. For the moment I’m just darn glad to be back in Berlin where we have no car at all. The car is off our hands. Long live the carless life! This entry was posted in Travel - Beyond Berlin and tagged cars, driving, Florence, Italy, Pisa, Tuscany, Volterra on April 28, 2014 by Jill M..
Jill, I’m glad you all didn’t careen off an Italian mountain! OMJ, as Cora would say!! Also, in my experience the US is the only place on earth where we don’t use carhorns almost constantly. In China it seems like the horn is attached to the engine! OMJ, indeed! Falling off an Italian mountain is not the exit I intend to take from this world. My one and only attempt at driving in a strange country resulted in the loss of a rental car hubcap in a ditch somewhere in Dorset. In that case I just couldn’t manage the switch to driving on the left. I’m traumatized enough about driving in the US where my knowledge of the Canadian Highway Traffic Act does me no good. It’s a brave thing to attempt in any foreign country. Glad it was only a hubcap you lost in Dorset!